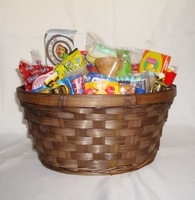 Our nostalgic candy basket would be the perfect gift for the candy. Each gift basket is filled with over 30 pieces of hard to find nostalgic candy from the past. You get a French chew taffy bar, a fizzies drink tablet, marshmallow ice cream cone, hot dog gum, wax bottles, fun dip � lik m aid, sugar baby, a candy necklace, Chiclets fruit gum, slo poke bite size chews, black cow bite size chew, boston baked beans, flipsticks � old time lipstick candy, a charms pop and more.